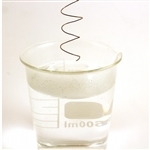 From chemistry sets, to crystal growing. Chemistry is an 'elemental' part of our lives. Just snap the stick and shake it up for a cool light source that lasts up to 12 hours! Great for parties, dances, concerts, campouts and more. Color is green. Bubbles you can touch! Blow them like regular bubbles, but after a couple of seconds they harden and can be touched without popping! Each test tube is 4-1/2" tall and contains 3/4 oz. of touchable bubble solution! This science project will put a bounce in your step. The process involves putting together a ball mold, adding powdered rubber, and submerging the mold in water. 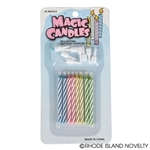 These trick candles are a sure-fire hit at birthday parties. Once you blow them out, they light again all by themselves. Each set of 8 in blister card packaging with instructions. Light these birthday candles and the burn in beautiful colored flames! 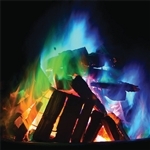 Red, Purple, Green blue and orange flames! 12 candles per box. Completely non-toxic and biodegradable. Candles are 2-1/4" x 3/16" diameter and burn for 8 minutes on average. childproof, windproof, with electrical ignition and is refillable.